Lady Spencer-Churchill, and by descent to the present owner. D. Coombs, Churchill his paintings, London, 1967, p. 248, no. 451, illustrated. Venetian Influence on Churchill, Daily Telegraph, 9 October 1979. M. Soames, Winston Churchill His Life as a Painter, A Memoir by his Daughter, London, 1990, p. 182. D. Coombs, Sir Winston Churchill's Life Through his Paintings, London, 2003, p. 255, no. C 451, fig. 475, p. 227, illustrated. Fulton, Westminster College, Winston Churchill Memorial and Library, on loan. London, Royal Academy, Horses of San Marco, October 1979, ex-catalogue. New York, National Academy Design, 1983, catalogue not traced. California, Ronald Reagan Presidential Library, Paintings as a Pastime: the Art and Treasures of Sir Winston Churchill, December 1992 - February 1993, catalogue not traced. In 1951, in his 77th year, and whilst working on the fifth and penultimate volume of his wartime memoirs, Churchill took his family to stay in Venice where in the afternoons he was able to swim in the Lagoon and to complete a number of paintings. The famous equestrian monument to Colleoni, outside the church of St Zanipolo, was the work of Andrea del Verocchio (1481-88), cast in bronze by Alessandro Leopardi in 1496. Other Venetian views painted by Churchill were the Grand Canal and Rialto Bridge, and the island of Torcello in the Lagoon. Mary Soames comments, 'During the visit Winston painted the great staircase of the Doge's Palace, the Colleoni Statue and the Rialto Bridge (his picture of which hangs in the Harcourt Room in the House of Commons)' (see M. Soames, loc. cit.). The article in the Daily Telegraph, 9 October 1979, commenting on the Royal Academy exhibition illustrates the present work and notes, 'There is an unexpected bonus for those trying to catch Olivetti's "Horses of San Marco" exhibition before its all-too-brief season at the Royal Academy finishes on Oct. 28. 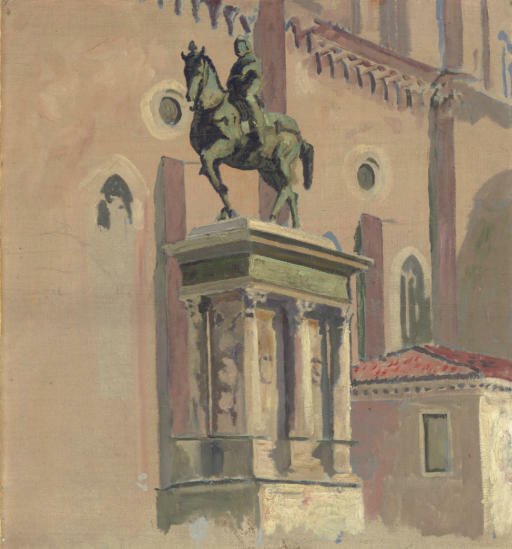 Alongside works by Leonardo, Dürer, Rubens and Sickert in the Gallery devoted to "Influences of the Horses", can be found a study in oils by Sir Winston Churchill of the Colleoni statue, thought never to have been shown in public before'.